this bridge called my back. Blair. 2005 David Lewinski Photo. If you belt out a song or poem or both, again, just one more time. As your biggest fans, we want the never-ending encore, my friend. As you strum your beloved guitar. Never wanting your livelihood stolen. From your days at the Cry-slur plant or the racial tauntings of your childhood in Jersey. Even the bag ladies pushing stolen shopping carts know you by name. Take a sip of the draft he just poured you, on the house, again. And whip out seven or eight of your albums to stop his stuttering. I know this because for years, I was one of those same fans. At our age, our minds start to slip, but at least we know our routines. We want the never-ending encore, my friend. You, a denizen of Greyhound and Amtrak. On the train, under the seat, in a box for someone else to discover. “Do you think I should’ve taken them home?” You asked. And you tried to talk them out of it, tell them a story and listen to theirs like you always did. In 15 years of living here. That’s when I should’ve started to worry about you, shaken. Uncover your star on the Hollywood Walk of Fame, next to Aretha or Paul Robeson. In the heat of the night to find peace in, just because it has air conditioning. You deserve so much, so much better, my friend. I hope somehow, in your short life, you realized that. Thank you for all that you did for Detroit, for our world, and for my family. Rest in Peace and Poetry. For information on Memorial Services and how to donate to the memorial fund for David Blair, please see: www.dblair.org Every bit helps. Thank you. Manny Pacquiao won his boxing match last night against Shane Mosley, which allows the boxer-turned-Philippine Congressman to retain his Welterweight World Champion title. Pacquiao is the only fighter to ever win eight different titles in various weight divisions too. While today is Mother’s Day, I know that my father is also smiling in heaven about the “Pac-Man” win. The last time I watched a whole Pacquiao fight was in March 2010, on the night of my father’s funeral. After the church and burial services, the Filipino Community of Seattle, Inc, graciously hosted the wake at their Community Center, where my father spent most of his free time. He had served as President of the FCS during one of its most controversial moments in history. After he retired from the ferries, he later hung out at the FCC weekly, for their Senior Lunch Program, which my late mother used to run. Then it struck me: Papa loved sports, especially boxing, what more when his fellow kababayan/countryman was fighting, so why don’t we just all watch it together? I asked Tita Alma if the Community Center had cable television. Yes, with the new remodel, of course! “Can we get Pay-Per-View? We’ll pay for it!” I said. “Oh, don’t you worry about that. We will look into it and take care of it. This was your mother and father’s second home. That is the least we could do,” Tita Alma said. 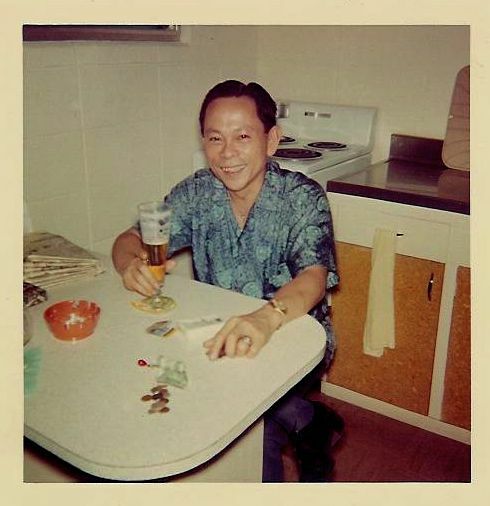 Papa would’ve loved watching the boxing match with all of his friends, especially at the Center for which he fought so hard to save from debt and the light-rail wrecking ball. On that Saturday, after the funeral services, the FCS board members and family friends laid out a spread of all of my father’s favorite food for the wake. Board members and the building manager also set up chairs in the FCC’s new vestibule and lobby. There, a flat-screen TV hangs on the wall, between the Restrooms and the Board Room, where my father’s picture hangs above the Board Room’s head of the table, with all of the other past FCS Presidents. Many of the folks who had been with us all day – all week, really – did go home, but about 70 of Papa’s friends and family actually stayed to watch the fight. Folks even paid a small donation to the FCC for the pleasure. That night, I sat next to my best friend’s father, Larry (who I grew up really just calling “Dad”). When I was a kid, Larry and his wife Edie owned a house on the corner of Juneau Street, right behind the FCC. At the wake, their daughter Andi explained to the crowd that is how we actually met as young kids, playing outside the FCC. Larry used to always talk sports with Papa, both of them loving Muhammad Ali. And just like when we were kids, Dad Larry narrated the whole Pacquiao fight, sitting on my right. Sitting behind me was one of my father’s closest compadres/friends, Uncle Rick Beltran, a past FCS President too. Earlier that day, at the cemetery, Uncle Rick was one of the last ones to place a rose in my father’s grave, saying, “Goodbye, old, dear friend. I will miss you.” After Pacquiao won the fight, I thanked everyone at the FCS for everything. Uncle Rick placed his hand on my shoulder and said, “Look at all these people. Your Papa would have really loved this.” Yes, I know. And here’s another Pac-Man win for you Papa! Sorry I haven’t kept up this blog. This has been a busy year and an even more difficult week. Last week, one of the pioneers in Michigan’s Filipino American community, Bonifacio Manzano, passed away at the age of 85 (blog post to follow soon). The same day that I had found out that news, my own 85-year-old father in Seattle was rushed by ambulance again to the emergency room for shortness of breath, and is still in the hospital. A few days later, my husband came down with Shingles, but is recovering. The next day, I found out that another Filipino American and former coworker, Nancy Abinojar, passed away at the young age of 52. Both Mr. Manzano and Ms. Abinojar were remarkable participants in our Filipino American Oral History Project of Michigan. I met Nancy Abinojar when I first started teaching at the University of Michigan (UM) in the year 2000. She was, literally, the first fellow second-generation Pinay (Filipina American) that I had met in Ann Arbor, as she worked in Women’s Studies, where I am jointly appointed. It felt comforting to see a sistah’s face the minute I walked in to the office (a rare treat at Michigan). I remember one day, watching Nancy sort out a pile of student applications to the program that had accumulated so high, she had to spread them out on the floor. I would go in her office just to hear her unique laugh. 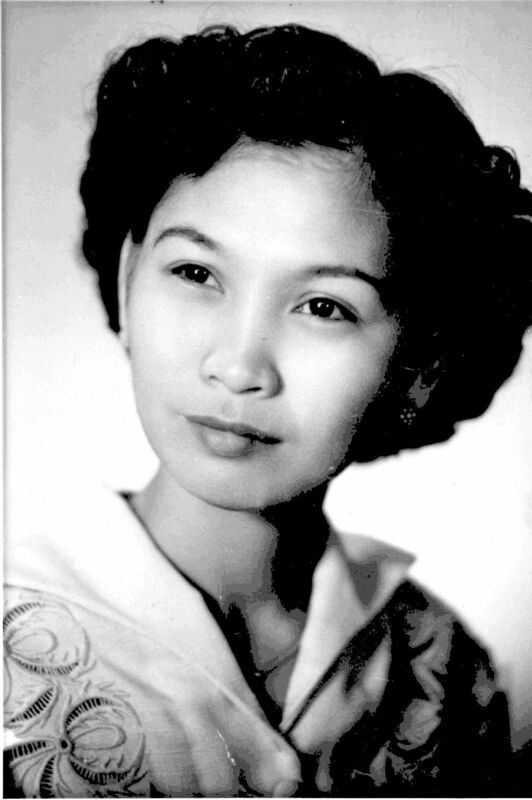 Weeks later, when I told her that I research and write about Filipino Americans, she told me about her father, Alberto Rivera Abinojar, who was born in 1908, graduated from UM, and still lived just down the street in Ann Arbor. “You are all pioneers!” I told her. When I asked if I could interview her and her father, Nancy was guarded at first, as she was understandably protective of her elderly father. The next year, I performed on stage at UM’s McIntosh Theater for “Tapestry: A Special Presentation of Dance, Music, and Poetry by Selected Filipino and Filipino American Artists”, sponsored by the UM Philippine Study Group. After the show, a Filipino man, not looking a day over the age of 65, walked up to me in the lobby. He introduced himself as an UM alum, asking me to guess how old he was. After a round of him saying, “No, older than that, older,” he pulled out his driver’s license and said, “I just turned 94!” When I read his name, I said, “Oh my god, you must be Nancy’s father!” I went into the office the next week to tell Nancy and she laughed. After that, they both agreed to be interviewed for our Filipino American Oral History Project of Michigan, offering us photographs and stories of their early lives in Ann Arbor. We are eternally grateful to Nancy for arranging this, as just a few months after we interviewed her father, he passed away at the age of 96. In 2003, Nancy received an award for 10 years of service at the UM. A few months later, after a change in leadership in Women’s Studies, Nancy left the office. I was surprised and sad to see her leave, but she said it was for the best. She called me a few months later when her father passed away; she was sorting through all of his photographs for the memorial and wanted to give us more for our next book. As I’m sure her grown children can tell you, she was so generous, even in her time of grief. at the University of Michigan. I was so happy to hear that she had found a new home there, with partners in the struggle. >With great sadness, we are writing to let you know that Nancy Abinojar passed away yesterday morning, following a courageous battle with cancer. As the NCID Office Manager since 2006, she provided first-rate administrative support for the NCID that was vital to its successful launch. Even during the last weeks of her life, she remained deeply invested and involved in her work with us. >As you can surely attest, she was a very dear colleague and friend, and her passing is a profound loss for all of us. We look forward to honoring her memory with you in the coming weeks and months. I am sure Nancy’s family and closer friends who knew her better will have more to share later today at the service. 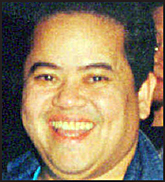 My deepest condolences to the Abinojar family. Thank you for sharing her with us. Mahal at maraming salamat / love and many thanks, Nancy, for all that you did to make this world a better place. Nancy Abinojar provides secretarial administrative support to the Director and Associate Director of NCID. A lifelong resident of Ann Arbor, she received an A.B. in Sociology from the University of Michigan and has worked at U-M for over ten years, with prior appointments in the departments of Chemistry and Math, as well as the Women’s Studies Program. Nancy was also appointed to a 14-member President’s Task Force on Violence Against Women on Campus during the tenure of U-M President James J. Duderstadt, as part of his Michigan Agenda for Women. Her interests in social justice include domestic violence and child welfare. She has previously served as a volunteer for SafeHouse, a shelter for domestic violence survivors and their families in Washtenaw County. Presently she volunteers as a court-appointed advocate for abused children. Today is exactly one year since my mother passed away. In a few hours, my cousins are hosting my mom’s “Babang Luksa”, what Filipino Catholics call the gathering to mark the end of a mourning period. Yet how does one really stop mourning one’s mother? It is really tough. In our clan, we do it the way our mother lived: with family and food. Traditional Filipinos (and “neo-traditional” Pinays like me) will often wear black for a year when a close family member dies. (I have to say that I did it because that is what my mother did when her mother died, plus it made getting ready in the morning so much easier.) After one year of mourning and wearing black, they “babang luksa”, or “drop the veil”. Some traditionalists (not me) will wear white veils to a Babang Luksa and remove them after the saying of the rosary to don bright-colored clothing. The “padasal” novenas, rosary prayers, and subsequent gatherings (usually around food) are like a rite of passage in our family. When we were children (and well in to our adulthood), my mother demanded that we all have some type of observance for deceased relatives and friends, out of respect. I think it was because she didn’t want their spirits to “visit” us. Then she would enlist all of us — her children and grandchildren — to help prepare huge trays of pancit noodles or majia blanca corn pudding, to bring to the wake. As much as I had protested, those precious moments were when I learned how to cook and when I learned the most about our family’s history. In modern times, some families mark the “Babang Luksa” after 40 days, like Lent, to symbolize the 40 days that led to the Resurrection of Jesus from the dead. My family actually has three+ observances: a nine-day novena/padasal right after one dies, then a rosary on the 40th day, and another on the one-year anniversary. Yup, that’s just how we roll, or pray, I should say. My cousins have been so generous and kind; they organized a private family observance for today, knowing how most of my siblings and I have been out of town, and my father is too frail to organize one himself. Last year, when Mom died, the Filipino Community of Seattle, Inc. organized a community memorial in her honor. Since she was the longest-serving FCSI council member, having served more than 35 years, her dying wish was to lie in state among her family and friends at the newly-renovated Filipino Community Center. She missed the ribbon-cutting the month before because she was hospitalized, so when then-Vice President Alma Kern gave a eulogy, she said, “Welcome Home, Manang Emma,” as it truly was her home-away-from home. The community memorial was a standing-room-only crowd; there must have been over 400 people there, so many people I haven’t seen for decades. Gotta go make the majia blanca. 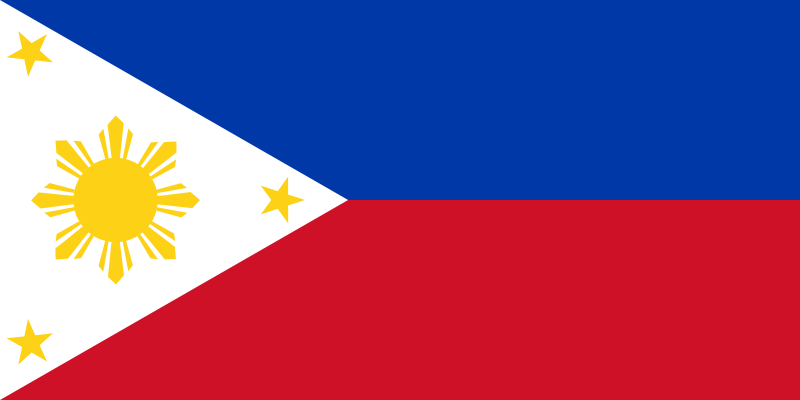 . .
Today, June 12, 2009, marks the 111th year of Philippine Independence from Spain, which had colonized my parents’ homeland for almost 400 years. My cousin, Oscar Peñaranda, has written about how his grandfather fought in the Philippine Revolution against Spain, while I, with my Filipino American life, always find myself packing sheets around this time of year, literally and figuratively. Now say it like your oldtimer uncle would say it, with a Filipino accent: “packing sheeeiiiiiittttt.” LOL. I always love how they can flip the “p” and “f” sounds, all puns intended. For a long-time-student-turned-educator, June is a crazy month, usually marked with final exams, submitting/receiving grades, and graduations. With that, comes the annual clean up, and often, the dreaded moving: to a new class, a new apartment, or even a new city. Forget weddings: you’ll hardly ever see any of my educator friends getting married in June. We’re too frazzled. As I wrote in my last entry, I spent most of June 2008 watching my mother die in a hospital bed in Seattle. On June 12th, I whispered to her how my husband had just called and said we have an offer on our Detroit townhouse that we had just listed for sale. In her comatose state, my mom moved her eyeballs underneath lids, still closed, and shed a tear. “Happy Independence Day,” I said. Packing sheit. Ah-hem, I mean, back to packing sheiiit. This morning, it is pouring down rain here in the Boston-area. It looks and smells like Seattle, with bus trolleys splashing puddles onto tired office workers waiting outside my front window. Our moving pod and good friends that we have made here will arrive in just a few hours. We are packing up our rental home, which we have loved for the last 10 months, so we can return to our other jobs in Michigan. And yes, in this recession, to still have a job in Michigan is definitely a blessing. So I leave with a thankful heart and no regrets, though we will miss our Boston friends. “I am packing sheets,” I said. “Again,” a tear coming to my eye. In the end, that is all that really matters. Packing sheeiittt. Last Thursday was my first Christmas without my mom; she passed away last June at the age of 81. 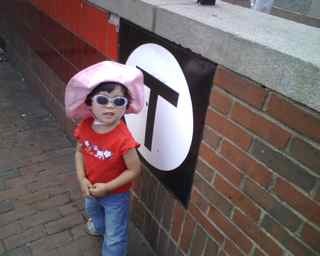 Finances are tight for us this year, not only because of the unexpected hospital and funeral expenses, but also because of our temporary move to the metro Boston area, where the cost of living is three times as much as Detroit. So our Christmas list this year was much shorter than previous years, with us trying to give more meaningful gifts. Instead of spending the holidays in snowy Seattle or Massachusetts, we’re spending them with my in-laws in Los Angeles, where they grow fruits and vegetables in their tiny backyard. When our toddler saw the tangerine tree in the back, she said, “Wow, satsumas!” and couldn’t wait to pick them fresh from the abundant dwarf tree. As I watched Anak pick the fruit, I remembered how when I was her age, my mom used to go down to Uwajimaya’s in Seattle’s Chinatown and buy crates of satsumas as Christmas gifts for her friends. My brother was allergic to them, so I didn’t really get their appeal. Then I moved to Boston and saw them selling for four bucks a pound! And those aren’t juicy or organic like Grandma and Grandpa’s! Anak picked about 50 of the satsumas straight from their tree; we washed them off and wrapped them up to give to neighbors and friends. With every juicy, tart bite, I keep thinking how much my mother would have loved for me to ship her a crate too. When I got married, Joanie gave us a 10 Year Membership to FANHS (like she does for many others). When my mother died, Joanie was the first to ask to what organization friends should make remembrances. 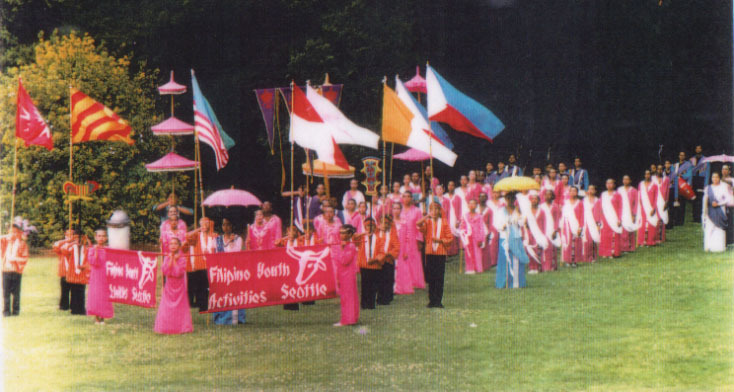 My mother was the longest-serving council member of the Filipino Community of Seattle, Inc, and belonged to almost every Filipino organization in the city, so it would be difficult to specify just one. Joanie never lets me forget how, when a FANHS delegation flew from Seattle to Manila for a conference, my mother sent a bag of store-bought cookies for everyone to snack on; although I was initially bothered by their weight, during our layover, we were grateful for those cookies because we didn’t have anything else to eat. As a World War II survivor, my mother was frugal, but she always made sure we had plenty of food. And although she never had a chance to earn a college degree, my mother valued education and believed in the importance of knowing and sharing our roots. 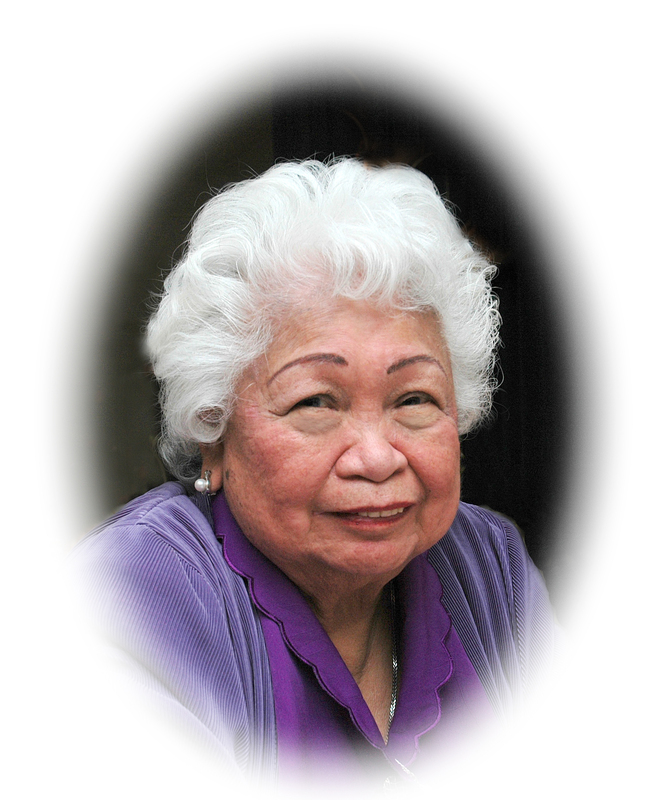 She may not have understood all that I do in terms of teaching and preserving Filipino American history, but she supported it in the simple ways that she could: through stories and food. 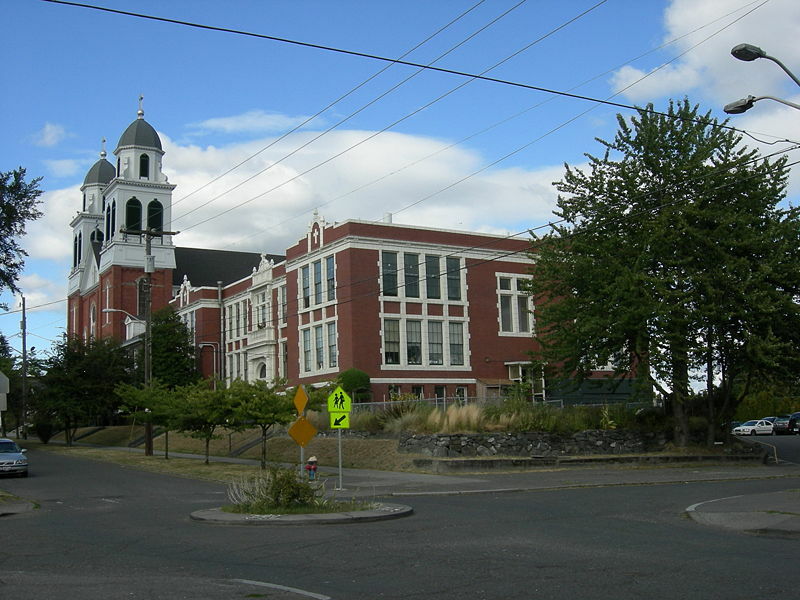 When my mother died, I had to write the eulogy, but did not have any of my material, so I went to the FANHS National Pinoy Archives in the old, converted Immaculate School in Seattle’s Central District. The archive barely fits in two rooms: one is an old classroom and the other is in the basement. When I was a teenager on the Filipino Youth Activities (FYA) Drill Team, this same basement was where we learned Kulintang (ancient gong music), practiced Arnis/Eskrima (the Filipino martial art), and heard aswang/ghost stories. The National Office of FANHS is upstairs, in what was once, 25 years ago, the FYA Trophy Room, where we had “brown room” meetings and cultural classes. Twenty-five years before that, it was probably my cousin’s classroom. The FYA offices are gone, but FANHS remains. Now cardboard file boxes pile high to the ceiling, with sepia exhibit photos peeling the paint from the century-old walls. A snooty university archivist once asked me if the FANHS office and archives, with its thousands of valuable photos, interview tapes, and material artifacts, had “climate control”. I chuckled and said, “I think there’s a dial that controls the radiator.” Of course, that radiator is covered with papers too. Joanie’s aunt, Dorothy Laigo Cordova, founded FANHS in 1982 and has served as its unsalaried, volunteer Executive Director since then. Auntie Dorothy’s husband, Uncle Fred Cordova, a retired newsman, is the FANHS archivist. When I arrived at the FANHS office (two days after my mother had passed), Auntie Dorothy shared a bowl of curry and rice she had made the night before. Downstairs, Uncle Fred had already pulled my mother’s files for me to see. They had material I didn’t even know existed: a speech my mom had written, a faded newspaper article on her parents’ arrival from the Philippines, a party invitation she had someone make. I still needed more, so I found her sister’s file, some of her organizations’ files, plus a book where part of her oral history is published. I felt so grateful to have this sanctuary of information, where I could research and write, and still feel at home: the memory of kulintang beats and childhood ghosts dancing in my ears. Before I left the FANHS archives, I whispered a prayer, hoping that when Anak is older, she can touch, read, hear, and smell all of this too. But prayers don’t pay the rising rent (even if Uncle Fred is now an ordained Catholic Deacon)! Remembering our pledge to give meaningful gifts, I wrote our check to FANHS and put it in the mail today, just in time to honor Joanie’s birthday, my mother’s memory, AND get our tax-deduction (since FANHS is a 501(c)3 non-profit organization). My mother would have wanted that, plus the satsumas, of course. Click HERE to Download FANHS Donation Form. UPDATE 2012: You can now donate online [in annual or monthly recurring donations] via PayPal or using a major credit card on the redesigned FANHS Website. Last week, the day after the historic election, someone asked me how it felt to vote. She knew that I had lived in Detroit earlier this year, and Barack Obama’s name was not on the primary ballot in Michigan (damn it), so I never had the chance to vote for him before. Now, I live in Massachusetts: ’nuff said. After she asked me that question, I went home and wrote this poem. I hope you like it; please leave comments below. Peace and salamat/thanks! despite centuries of broken promises. to protect her and her children. she suffered from lung disease. and we were never the same. "Gardeners and grounds keepers, parks, cemetaries, etc." he never lived long enough to explain it to his daughters. asking if Obama had won the primaries. she closed her eyes and smiled. to finally feel like a true American. “This is our time. This is our moment. So I took my time, savoring the moment. and prayed that our President, our next President will remember them too. Padasal = Filipino for novena, a prayer session for the respose of the souls of the dead. “Leadership is only incidental to the movement.